Editor's Note: Below is an excerpt from today's Early Look written by Director of Research Daryl Jones. Click here to learn more about the Early Look. In the Chart of the Day, we highlight a key slide from Q2 Macro Themes deck that looks at Oil v. 10Y break-evens. 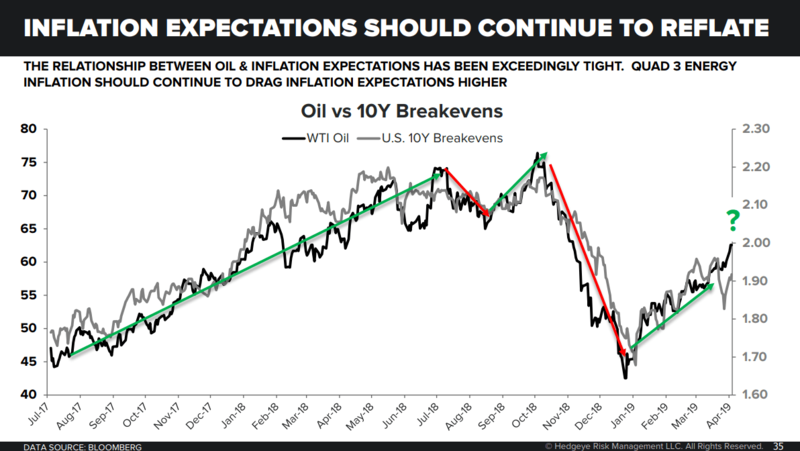 As the chart quite obviously shows, there is a tight relationship between oil and inflation expectations. The implication is that #Quad3 Energy Inflation will continue to drag up inflation expectations. This path will only accelerate with a weak dollar in the second half of 2019. Simply: more cow bell = weak dollar = rising inflation.